Where anyone can enjoy my unique blend of awesomeness! Today was a rather rough day for me. I did have the day off work. I have been distracted by the fact that I believe I’m getting a sinus infection. The worst part is that it only seems to be effecting my right eye. For the last couple of days my eye has been very sensitive to the touch near both corners. It’s been watering quite a lot and every time I wipe away the tear, under my eye is very tender. It also hurts when I blink. Alright, enough of my rambling about a potential ailment. Whenever I’m not feeling 100% I sidetrack myself by doing something creative. So I worked on an icon for my blog that is representative of myself. I finished one and put it on the blog site but when I looked at it again today, I don’t think it’s the one to use moving forward so I’m going to take a little break from rambling and work on a more accurate icon. I’m back and that was about 40 minutes worth of work but I am much happier with this blog icon picture than my previous one. This particular one is more inclusive of pieces of me that I appreciate about myself. When I was working on this icon I was considering what elements to add that would visually represent important aspects of my person. It only took a moment for me to realize that it’s pretty much impossible to squeeze myself into a little graphic that is less then 500 square pixels. So I picked a few characteristics that suited me and went with it from there. Just in case it doesn’t come across when I post let me tell you what I put together. As I mentioned previously, I collect monkeys and have a particular fondness for sock monkeys. I also love rainbows for a variety of reasons. As a creative soul I love the depth of color theory reflected in one of nature’s most simple and marvelous occurrences. I also adore that the very same nature’s miracle has been chosen as the celebratory flag of diversity representing the LGBT community. I have also rather recently discovered and started working on improving my relationship with God. 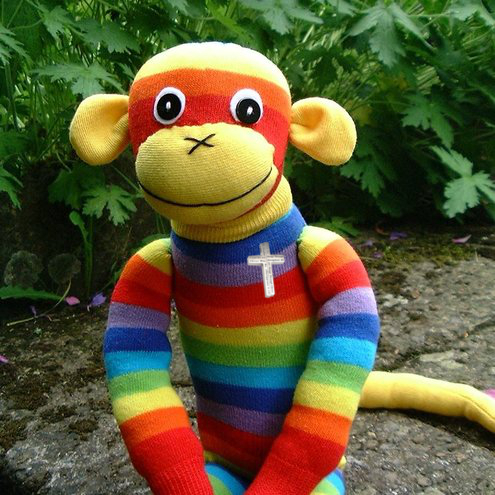 I found a rainbow striped sock monkey and placed a copy of the cross I wear every single day on it’s chest. Moving on…this evening I wanted to talk about something that I don’t believe I’ve shared with any of you as of yet. That being said if you are a friend on my Facebook page this won’t be any surprise to you at all. Tonight one of the pages I like shared an image of a magnificent deer. The caption on the deer read, “When I look into the eyes of an animal I do not see an animal. I see a living being. I see a friend. I feel a soul.” The moment I saw the powerful image and read the accompanying words, my heart was touched with it’s absolute truth. Since I was a young kid I’ve always had a very genuine and sincere bond with animals of all kinds. I am a lover and advocate for animals, their rights and humane treatment. In the first place we lived together which was in Ohio, that’s where we started rescuing our furry family. We rescued all 5 of our cats from 2 different facilities. Of the 5 we decided to rescue by bringing into our home. Over 9 years ago we adopted 3 adult cats and 2 kittens. Today we live with 4 of our 5 original cats and we’ve since inherited 2 dogs. I will write a bit more about the furry kiddos another day. For now – good night! I am awake and feel like I’m ready for bed again. I was approved by an assistant manager for Sunday off work a couple of reasons. When I was hired HR told me that I’d be working 4 days and off 3 days in a row. I mistakenly thought it was the date for the ladies night event at church. I was incorrect, that will be this coming Sunday but since I had been approved already – I didn’t go in to work on Sunday night. After my first full 4 day shift, I was honestly just completely exhausted. Not only was I exhausted but I was almost in full-on zombie mode when clocking out and beginning the slow painful limp out to my car. When I last listed for you an itemized listing of my injuries, I failed to list the random bruises, scratches and bumps that magically appear on my arms and legs. I seriously look like someone has smacked me around with a broomstick or something. I have at least 2-5 bruises or scratches on each arm and leg. I was laughing the other night when I first noticed them because I look like I’ve been beaten. Now before anyone comments on how I need to be more careful or express concern about my job being overly dangerous, let me just say relax. My job is quite safe. I have always bruised very easily. Even a motion as simple and painless as pulling a box of 12 canned corns off the shelf and sitting it on the floor can result in a couple of bruises. So after my first full shift of days I was able to limp inside my house and collapse into my favorite chair. I still have that huge blister on the back of my heel and it’s killing me. It’s not so much that it is actually painful because it’s really not. It’s that I have this huge water tumor looking thing on my foot. It’s pretty disgusting to look at and I need it to go away so I can wear my sneakers without a big Band-Aid. The last bit about work for tonight is that I am enjoying the team I am a part of during our overnight shift. Everyone seems nice and it’s very team oriented toward the common goals of getting all team members tasks completed. Overall I’m glad I finally got a job and even though I feel a new set of aches during every shift, I’m happy to be working again. On to more interesting subject matter. I’ve been thinking more than usual about my relationship with God. As for my promise to stay awake and make it to church, I didn’t make it this week either. After all 4 shifts in a row for the first time I was extremely tired. I came home and tried to shower later in the morning to postpone breakfast/dinner. I thought if I postponed it long enough that I’d be able to just shower, change and head right to church. After removing my shoes and socks and reclining back in my chair I started dozing off. I kept trying to wake myself and prolong my overall amount of waking hours but I was not having any success. I eventually just caved in and grabbed my shower before eating and crashing gloriously into bed. My 2 weeks of missing church in a row are weighing heavily on my mind and heart. I am sad and disappointed about missing 2 of my pastor’s sermons. I truly do love my church and the complete loving feel of my church family. I have found a co-worker that is comfortable talking about faith. I still haven’t completely dedicated myself reading my daily devotionals and bible passages. I know I am the one in charge of managing my time and everyday I say I’m going to sit down and put the tabs in my bible to make it much easier to reference for devotional readings. I am going to make a promise to get my bible done before this time next week. On the upside I do get daily bible passages to read daily. I also subscribe to a daily message from God. The daily message is much like a real life application of basic principles of living my life through God. More on everything later. I hope everyone is having a great week. Good night and I’m off to dream of awesome opportunities!